Guide to Cibola County, New Mexico ancestry, genealogy and family history, birth records, marriage records, death records, census records, family history, and military records. County Clerk has records from 1981. 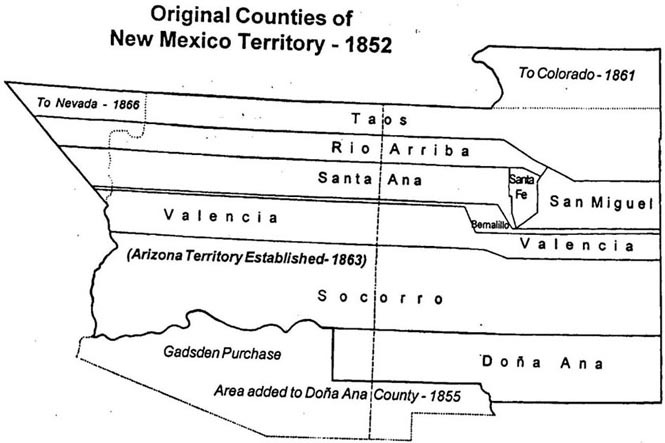 Until 1821 - Spain controlled the land, called New Spain, that later would become Arizona. Records may have been sent to the archives in Seville, Spain or to archives in Mexico City. In 1821 - Mexico obtained jurisdiction over the land that later would become New Mexico. Records may have been sent to archives in Mexico City. 18 Aug 1846 - During the war with Mexico, the US took control of Santa Fe and proclaimed sovereignty over the land that later became the New Mexico Territory. Look for records in the National Archives and Records Administration, the Mexico Archives and the New Mexico State Records Center and Archives. 4 July 1848 - In the Treaty of Guadalupe-Hidalgo, Mexico ceded most of present day New Mexico. The land south of the Gila River was not ceded, it remained in control of Mexico. Look for records in the National Archives and Records Administration, the Mexico Archives and the New Mexico State Records Center and Archives. 9 Jan 1852 - New Mexico redefined the boundaries of previous counties and created new ones to cover all the land within its territory. Valencia County was expanded to cover land that stretched across what is now New Mexico, Arizona and Nevada. Look for records in Valencia County. 19 June 1981 - New Mexico created Cibola County from the western four-fifths of Valencia County. Look for records in Cibola County and Valencia County. Local histories are available for Cibola County, New Mexico Genealogy. County histories may include biographies, church, school and government history, and military information. For more information about local histories, see the wiki page section New Mexico Local Histories. USGenWeb project. Maps, name indexes, history and other information for this county. ↑ Alice Eichholz, ed. Ancestry’s Red Book: American State, County, and Town Sources, Third ed. (Provo, Utah: Ancestry, 2004), 470. ↑ Wikipedia contributors, "Cibola County, New Mexico," in Wikipedia: the Free Encyclopedia,https://en.wikipedia.org/wiki/Cibola_County,_New_Mexico, accessed 25 January 2019. This page was last modified on 26 January 2019, at 01:48.